Label materials fall into two categories – papers and films. There are pluses and minuses with both types. Film costs are a little more than paper but understanding the environment of where your label will be applied, will help with the decision. 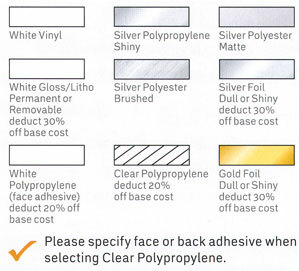 Top coatings like varnish and laminates are available on any label material. White Gloss Paper – Our most popular lustrous gloss label paper that provides excellent 1-4 color process print quality. Recommended for indoor applications and not meant to written or typed on the label. Also available in yellow gloss paper. White Matte Litho Paper – A sister paper to white gloss, but without the shiny coated surface. Thhe coating has a flat matte surface and is a excellent paper that provides quality 1-4 color printing. This material can be handwritten on the label. Also available as a matte yellow litho paper. 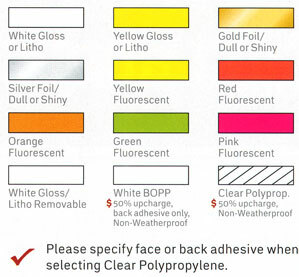 Fluorescent Label Paper – Available in 7 bright day glow colors. Orange, yellow, green, red, blue, purple and pink. 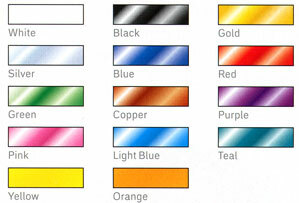 Most commonly used for warning labels, color coding files and awarness. Black ink is recommended and the adhesive is permanent. Gloss & Flat Gold and Silver Label Paper – These shiny and dull metallic papers are commonly used for packaging, foil stamping, awards and blind embossing. Spot colors work great on these papers and the adhesive is permanent. Excellent papers for creative designs. White Opaque Polypropylene Film is perfect due to how well it matches to white containers. This versatile material is used in a variety of beauty, hair care and household products. White Vinyl Film is a thicker material than polypropylene and works best when long term of 4+ years of outdoors label use is needed. Polypropylene should not be ruled out if 1-2 years of use is needed. Clear Polypropylene Film creates that “no label look” on acrylic, various glass and plastic colors. White ink is usually needed as a base opaque color so type and graphics do not get lost. Chrome Foil Film is a mirror-like reflective film that with the right design makes an eye catching label at very little additional cost. This material is as durable as the polypropylene and vinyls. Holographic Foil Film gives sparkle, pizazz and has many patterns that look outrageous when light reflects off of the film. Perfect for any size rectangle, circle, oval, square or any custom shape. AnyShape Labels are cut with new laser technology that you can actually order any shape with no additional die cost. Printed digitally or flexographic based on quantity. Orders Ship: 24-48 hours from proof approval. We have 100’s of label materials. For a specific material not seen on this page, speak to your sale representative at Blue Line Labels. BOPP stock is Biaxially-Oriented Polypropylene. We can match any PMS ink color(s) you require for a nominal fee. Digitally Printed Labels: Choice of Premium Papers, Films, Vinyl or Foil. Digitally printed in full color and gloss laminated for moisture protection. As low as 50 digital labels can be quoted, designed and shipped the same day if needed. Premium Foil and Embossed Labels: This group of materials are specifically designed for superior release when foil is being stamped. Blind and multi-dimension embossing shows an image pressed into the material to raise it above the material. Produces an elegant look for a sophisticated product and presentation. White, yellow and orange foils are only available in a matte finish and look best on clear polypropylene material. Remaining colors are shiny and looks great on any approved material. See Foil Label Samples for ideas. Extended Life Decals: Printed only on Vinyl, Polypropylene or Polyester Stocks. Labels are manufactured to withstand harsh environments and rugged applications. Weather and sun resistant for up to 4 years. Premium Static Cling Labels: This group of materials are specifically made to be easily applied to glass or any smooth surface. Available in clear or white static cling vinyl. Labels have no adhesive and adheres to glass or other smooth surfaces with static electricity. Weatherproof Labels: Printed only on Vinyl, Polypropylene and Polyester Stocks. Laminated at No Extra Charge. These labels can withstand heat, cold, water and sunlight for up to 1-1/2 years. Bumper Stickers: Rectangle Bumper Stickers includes a 1/4″ tab for easy removal. Oval and Circle sizes will be scored on the liner. Variable data technology offers unique numbering sequences, random barcodes, random type and custom images. Weather and sun resistant for 4 years. Perfect for areas that are poorly lit that requires high visibility. Stock appears more silver than white in color. Perfect decal for outdoor and safety needs. As few as 50 labels can be ordered. We cannot guarantee an exact PMS match for Reflective Labels. Patterned adhesive that allows the label to be applied and reapplied to almost any surface. Removes cleanly without leaving any residue. White Gloss Repositionable material for indoor use. White Polypropylene material for indoor and outdoor application. Lamination is suggested if being used outdoors. Tamper Evident leaves a checkered or void mark on the surface when removed. Tamper Destructible is a white polyethylene that shreds or chips away when removed leaving the decal un-usable. For indoor use and allow 24 hrs for label stock to set. Void pattern not recommended for small labels. VOID lettering is 3/16″ tall. A Silver Void and Checkered Patterns leaves a tamper mark on surfaces when removed. Highly Destructible White Polyethylene shreds when removed leaving the decal not usable. Tamper Evident labels cannot be machines applied. Blue Line Labels delivers your order accurately and on time. Our 20 years of art, design and print experience will assure you of an excellent quality product and a professional cost effective relationship. We can help from design to delivery or anywhere in between.